emersion DESIGN provided design services on a design/build team for the renovation of Building 23 at Wright-Patterson Air Force Base, originally constructed in 1934 as an aircraft hangar and aircraft component test facility. The goal of the renovation, involving 53,378 sf, was to provide a modern laboratory facility, where state-of-the-art research is conducted for energy, power, and thermal management to support current and future Air Force applications. Three floors were involved in the renovation, with spaces for materials processing, data acquisition, clean room operations, dry room operations, and fabrication facilities. Architectural design was intended to maintain the historical nature of the existing building while constructing a three-story facility within the existing brick shell. An enclosed bridge extends from the third floor of the new facility to the second floor of an existing building. The $23 million building houses high-bay research areas, test cells and high power test cells, a turbogenerator lab, fabrications shops and labs for physics, thermal, laser and other electronics, class 10,000 clean rooms, dry lab spaces, administrative spaces and supporting spaces. The facility also includes mechanical rooms, electrical rooms, communications rooms, rest rooms, and a passenger/service elevator that accommodates laboratory equipment. The building design had special acoustical needs due to the use of vibration-sensitive equipment such as lasers and optical equipment. Engineering services included design for HVAC, plumbing, steam, lighting and power distribution, communications and security, utilities, storm drainage, lightning protection, and fire protection. Site work included sidewalks, curbs and gutters, access drive control systems, and site upgrades. Architectural and comprehensive interior design was also included as part of the project. The project was designed to LEED Silver level, with sustainable design including Brownfield Redevelopment (asbestos abatement), alternative transportation, water efficient landscaping (no irrigation), water use reduction to 40%, optimizing energy, enhanced commissioning and refrigerant management, construction waste management, recycled and regional materials, certified wood use, increased ventilation, construction IAQ management plans, low emitting materials, controllability of lighting systems, and thermal comfort design. 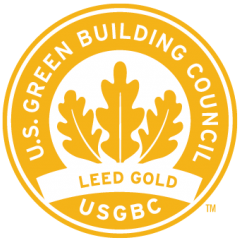 The design/build was able to develop additional credits (at no cost to the government) to achieve a LEED Gold rating.